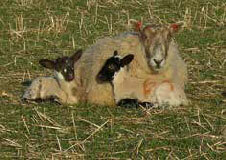 Jackie and Morag Rennie, have a mixed farming unit in the lowland North–East coast of Scotland. They use Essie Suffolk rams on their 300 Mule cross ewes. Lamb vigour at birth is an important essential with a spring lambing on a family farm which also has a busy farm shop, growing all their own vegetables. Jackie and Morag have bought Essie rams for over 15 years – 2 / 3 every year.